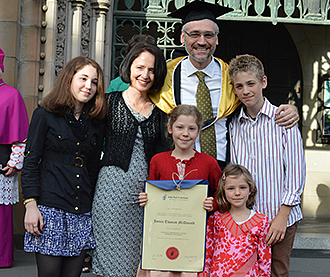 Father graduate: John Paul II Institute for Marriage and Family masters graduate James McDonald with his family outside St Patrick’s Cathedral, Melbourne. Photo: Hannah Hladik. THE John Paul II Institute for Marriage and Family in Melbourne offers courses in four general streams: Religious Education (RE), Bioethics, Theological Studies (Marriage and Family, and Theology of Psychology and Counselling), as well as offering a PhD by research. A spokesperson for the institute said it also offered a Masters in Sacred Theology degree which was the civil equivalent of the Pontifical STL. The Graduate Certificate in RE can be completed online and satisfies the accreditation requirements to teach religious education in a Catholic school in Queensland. “The institute is particularly strong in the areas of moral theology, theological anthropology, bioethics and subjects that lie at the intersection of theology and culture, such as ‘The New Evangelisation in Post-Modern Culture’,” the spokesperson said. The spokesperson said the institute’s Bioethics qualifications were designed “for health professionals who wished to be able to engage with the ethical and policy issues affecting their profession, for people involved in public policy formulation, for teachers in schools, especially those teaching in the areas of sexuality and personal development and for professionals who are members of ethics committees”. “Qualifications in the Marriage and Family stream open up possibilities for working in the life, marriage and family, and youth ministry fields or related fields such as fertility awareness education,” the spokesperson said. The institute is one of an international network of John Paul II Institutes connected to the Central Session of the Institute at the Pontifical Lateran University in Rome which was personally founded by St John Paul II in 1981. The Melbourne session opened in July 2001 under the auspices of the Melbourne archdiocese.